The Raspberry Pi Manual is the perfect introduction to the affordable small computer. 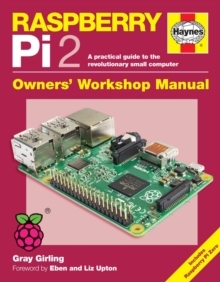 This new edition covers the Rasberry Pi 2 (model B) and is printed in full colour throughout. It is aimed at those switching on their Pi for the first time, guiding them through the full process of setup and configuration. The manual then introduces various aspects of computing and programming - subjects that have been sadly absent from the school curriculum for many years - and provides a variety of recipes to demonstrate the acclaimed versatility of the Raspberry Pi's hardware and software. With authorship from an expert close to the project and the trademark Haynes `how to' approach, this is the manual everyone needs to get started with their Raspberry Pi, whether at home or in the classroom.